The index opened positive but saw selling pressure from the highs and closed weak but still well above 8600 at 8622.90, small loss of 13.65 points. The broader market was weak with 484 advances to 1137 declines. Range for the series stays at 8500-9000. Call option 8600-9300 added 32.25 lacs OI with small short covering at 8500 and below strike prices. 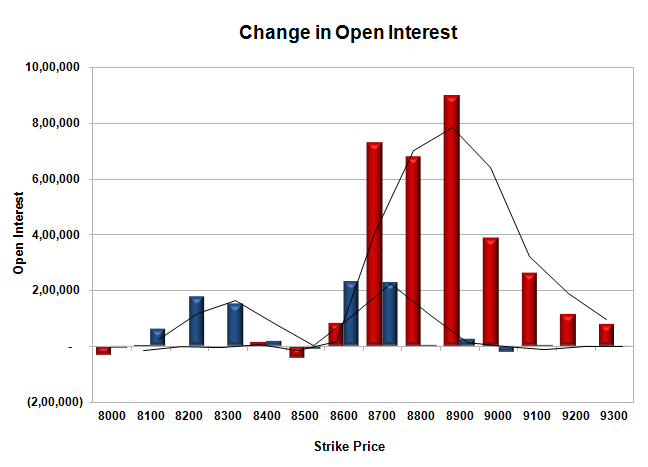 Put option 8700-8100 added 8.44 lacs OI with small short covering at 9000 and above strike prices. 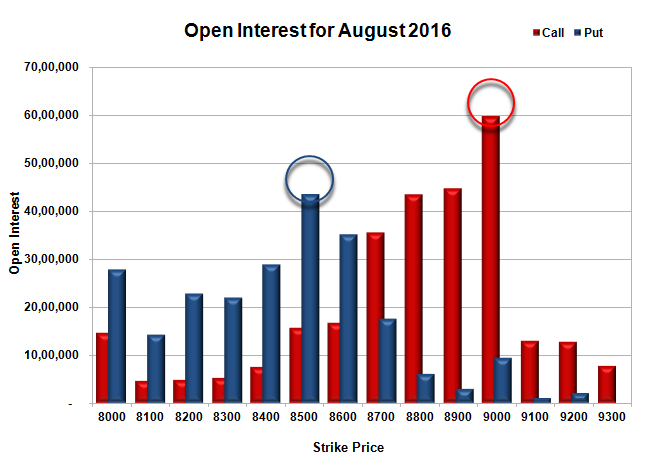 Nifty Open Interest is at 2,27,11,700 up by 2,85,975, with decrease in price, most probably short build-up. 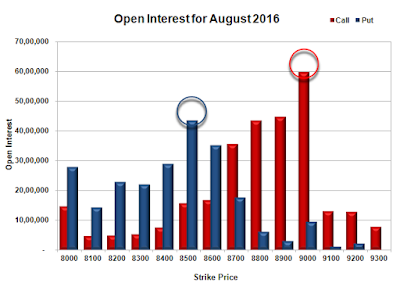 Bank Nifty Open Interest is at 19,08,400 up by 18,680, with decrease in price, most probably short build-up. FII’s sold 144 contracts of Index Futures, which includes net 2694 contracts long build-up and 2838 contracts short build-up, with increase in net OI by 5532 contracts, includes 21523 longs to 21667 shorts for the day. FII’s Index future open contract as on date is 263334 Longs to 35874 Shorts, Net long 227460 contracts. Initial support at 8600, with OI of 35.20 lacs and below that at 8500 with OI of 43.48 lacs. 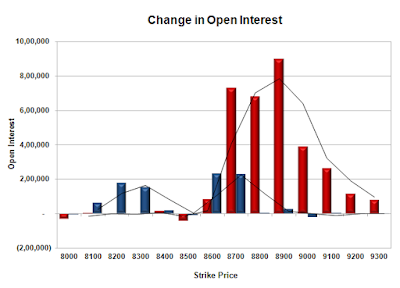 Initial resistance at 8700, with OI of 35.57 lacs and above that at 8800 with OI of 43,50 lacs. 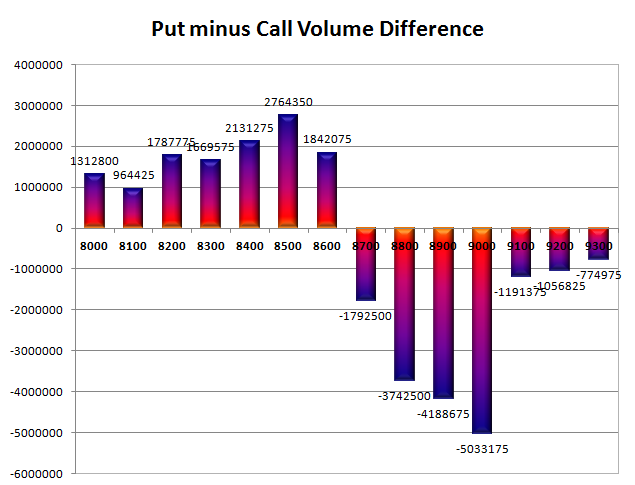 Day Range as per Option Table is 8578 - 8694 and as per VIX is 8552 - 8694 with 8641 as the Pivot.